With my 2nd toolhead independent in X and Z how do I setup my home Z to probe the 1st and 2nd tower not at the same time? I want to do 1st tower and then 2nd tower right after that. I looked at G30 documentation and it did not mention anything about multiple Zs configuration. Have you read https://duet3d.com/wiki/Bed_levelling_using_multiple_independent_Z_motors ? RRF doesn't support mapping the Z axis in the same way that not supports X and Y axis mapping. However, you could use the tool change files to remap the Z axis to different motors and to !lad a different height map file. For initial homing, you could create another axis to be the second Z axis, then specify in the M574 and M558 commands that it uses the Z probe for homing. Yes I have. It appear that article is more about how to level a bed held by multiple Zs. 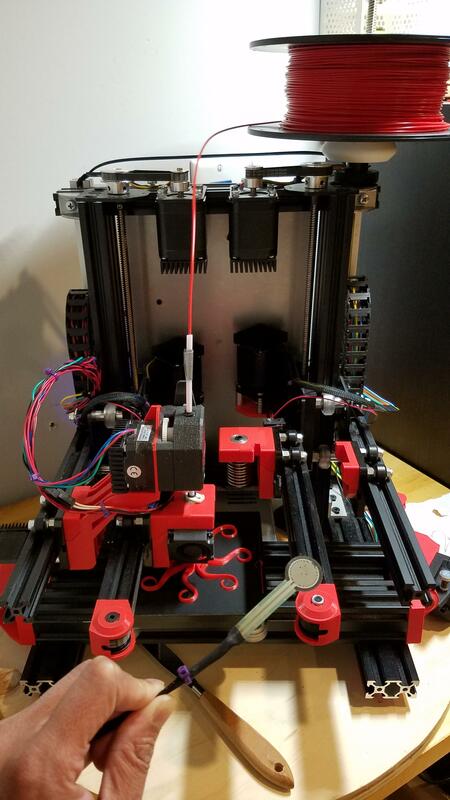 My specific bed setup doesn't connect to any Z and I actually didn't need any bed leveling as I was able to physically align the printer. To explain my printer in more detail, basically I have 2 separate Z gantry each with it's own set of X gantry, extruder and hotend. The bed move in Y axis. Combined, I need 7 driver motors. I was able to home the first Z with G30 and actually print something. Now that I added a 2nd set of Z, I'm not sure how do I home that 2nd Z. Is there a way to use G30 for that 2nd Z? Yes. To home the first Z axis, use M584 to assign just the Z1 driver to the Z axis. To home the second Z axis, use M584 to assign just the Z2 driver to the Z axis. It seems every axis created would need home_.g. should I create homeZ2.g and homeZ5.g then? You can put both of those gcode fragments in homez.g and homeall.g. Did you raise Z2 before doing the G30 with Z5 ? ah for the 2nd tower it actually says "Zprobe was not triggered during probing move"
So the second nozzle isn't triggering your under-bed FSRs? Btw I think you should join the Z axes later in your homez.g file, otherwise the first nozzle will end up 5mm higher than the second nozzle when it is working. yeah I caught that too. moved the join Z to bottom. printing with 1st tower only at the moment. would really like to get the 2nd tower printing soon. I think I have spotted the problem. Before the Z axis has been homed, a plain G30 command will lower the head up to 1.1 times the Z axis height declared in your M208 command. After homing, it will only lower it as far as one dive height below where it thinks the bed is. So one solution would be to increase the dive height (M558 H parameter) to the axis length + 5mm, just before the second G30 command, and restore it afterwards. Another possible solution is to send M18 Z just before the second G30 command, to turn off the Z motor current. This will flag the Z axis as not homed.